PowerBurst PB11000 : Dual USB output 11,000mAh rechargeable Lithium Power Bank-Charger pkg for Phones, Tablets, etc. Get instant power for your smartphones and tablets at home, work, school or while on the go. Talk, text, browse or listen on your mobile devices whenever you want, for as long as you want, and still have power when you need it ! 4A output enables you to even charge up to 2 tablets at the same time ! 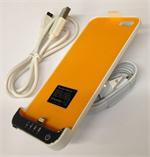 PowerBank is an 11,000mAh high-quality Lithium Polymer rechargeable battery. Unit size approx 5" x 3" x 0.75". PowerBank has Dual USB2.0 outputs for simultaneous charging of two devices. PowerBank also has a micro USB input port for re-charging. 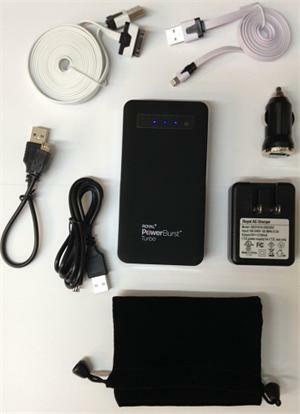 PowerBank unit has 4A max combined output capability, so it can even charge 2 iPads at the same time ! Weight of main PowerBank = 8 ounces. Total package weighs under 1 pound. Charges iPods, eReaders, digital cameras, iPhones, iPads, Tablets, MP3 players, etc. - if a device charges from a 5V USB port, it can likely charge from the PB11000. Wire selection allows you to recharge battery from other USB output connections as well. 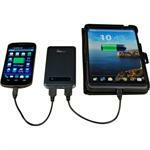 With the wall charger, the typical full re-charge time is approximately 6 hours. 1 USB Micro charging cable, 1m long. 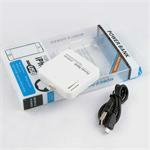 1 DC Charger (1A output) - plugs into 12-13.8VDC socket, and has a USB2.0 output.